rice krispie treats are very simple. just follow the directions on the box of rice krispies and for the love of all that is sweet and ooey gooey: do NOT, under any circumstances microwave your ingredients. always melt them low and slow on your stovetop. if you use the microwave, the texture is all wrong and you end up with hardened rice krispies that are difficult to eat. in a large saucepan (i use my soup pot), melt your butter. add marshmallows and vanilla, stir until completely melted. add rice krispies, stir until evenly coated. pour into a greased 9×13″ pan, pressing in with waxed paper or a nonstick spatula. pictured above is a variation that i like to make. follow the directions above, but add 1/2 c peanut butter when you add marshmallows and vanilla. I top mine with 1 1/2 c melted semi-sweet chocolate chips, melted with 1 1/2 tbsp butter. (you can melt this in the microwave at 30 sec. intervals, stirring constantly.) 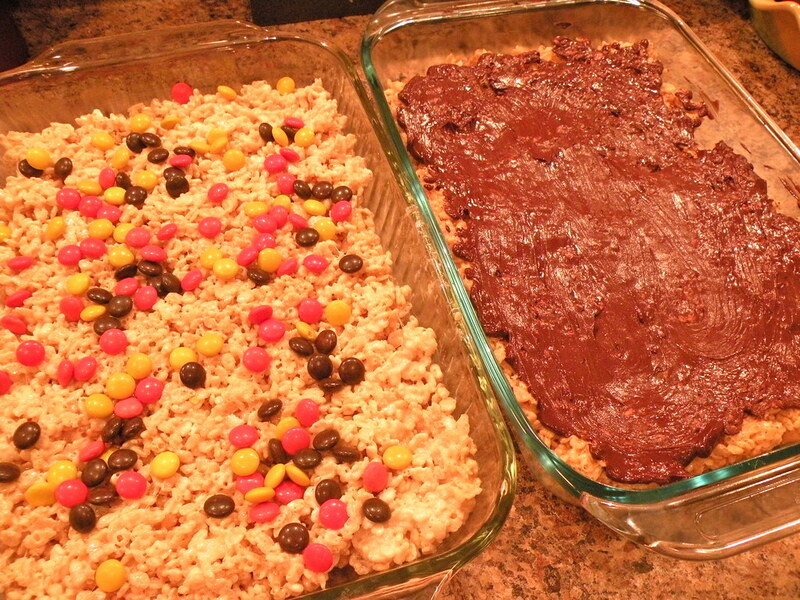 spread chocolate mixture over the top of the rice krispie treats. there are also a ton of variations out there for making rice krispie treats. some people enjoy the fruit flavored marshmallows, others use cocoa krispies, while others use cheerios. the possibilities are endless and the recipe is so simple, it should be easy to find your favorite flavor combination.